There are well over 10,000 lobbyists in Washington, not to mention countless labor and business leaders, public relations specialists and advocates of all stripes vying to influence Congress and the federal government. But when it comes to shaping federal policy, some have set themselves apart. These are the lobbyists who’ve mastered the art of working Capitol Hill’s hallways, whose Rolodexes are stocked with names of power brokers and who lead groups that simply cannot be ignored. According to the Hill, American Defense International Inc., and its leadership team, led by Michael Herson, are known as the most influential amongst the largest defense contractors to fight for them in Washington. Borenstein Group was engaged by ADI to help visually communicate its brand dominance in Washington through a fresh and modern website that will match its incredible credentials and reputation for results. To bring to life American Defense International’s reputational equity on Capitol Hill and deep expertise in serving high-tech defense and aerospace leaders, Borenstein Group crafted a digital strategy that focused on highlighting through video animation of engaging defense technologies ‘in the moment’seen from a ‘user perspective’ to communicate ADI’s mantra which is focused on serving its client interests. Unlike many firms that focus on saying how ‘they are the best,’ ADI’s new design stood out by engaging the audience to immediately connect to the firm’s subject matter expertise and expedite the call for action to connect. 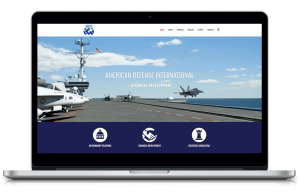 A second part of the digital design strategy involved bringing to the forefront of the site the impressive list of ‘Who’s Who’ in the defense and aerospace sector which ADI represented over the past decade, accelerating the “build” of digital trust. Most importantly, the new website is fully responsive and designed to be viewed on mobile devices, tablets, and traditional desktops. American Defense International (ADI)’s executive leadership team reported its new digital presence has been well-received by its loyal following of thought leaders and politicos on Capitol Hill and has achieved its primary objective of projecting the firm’s proven success and the deep bench of subject matter experts second to none in the defense lobbying industry.